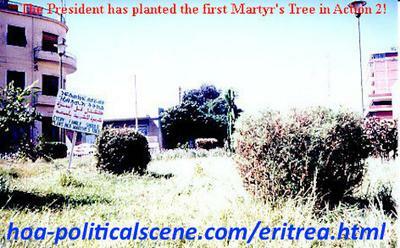 hoa-politicalscene.com/eritrean-hopes.html - Eritrean hopes: Martyr's tree in journalist Khalid Mohammed Osman's environmental project planted by the Eritrean President Isaias Afewerki on the Martyrs street. 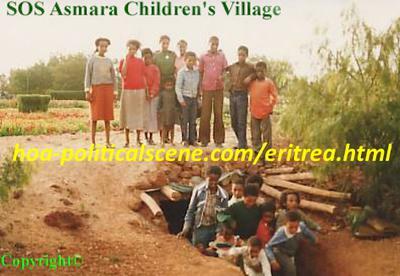 hoa-politicalscene.com/eritrean-hopes.html - Eritrean hopes: SOS Children's Village in Asamara before closing it. 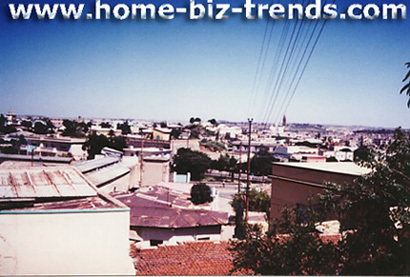 The organization has saved many souls during the first long Eritrean-Ethiopian war. 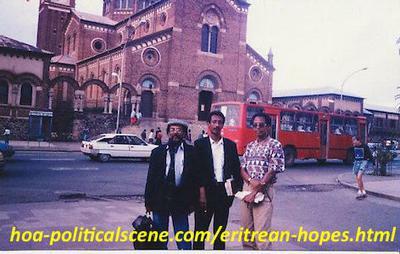 hoa-politicalscene.com/eritrean-hopes.html - Eritrean hopes: Journalist Khalid Mohammed Osman with his brother chancellor Mubarak and friend artist Altahir Salih in front of the Cathedral in Asmara. We had Horn African and Eritrean Hopes in Eritrea on the period from 1991 to 1996! 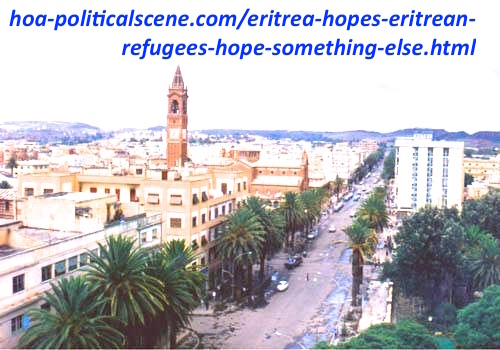 The Eritrean president walks free on the streets, sips a fresh cappuccino in the main City Park, or walks to some official, or public bureaus. We had hopes that time of a new era, not just in Ethiopia and Eritrea, but also in every state in the Horn of Africa! I had always spoken about those by now faded hopes with some of my friends in the leadership and written about them in the official newspaper long articles, until 1996. Then the hopes elapsed suddenly and broke the national hearts and mine. I anticipated that had happened also in Ethiopia to the liberation fighters who fought shoulders by shoulders with their brother comrades in Eritrea, have their bloods mixed and absorbed by the national soil, while giving their souls to the national struggle and entered Addis Ababa together in 1991 in a terrific victory. A moment no one will ever forget, because that was the real struggle and from that lesson, which imposes this picture of hopes the leaders should learn better to stop the madness. The frustration of the broken hopes victimized many revolutionary people. Bad things happened to sincere people. Among them, I tried to manage the failure by living a bohemian life for a short time, sipping much beer in many bars and scattering into pieces on the streets. Yes, it was a tough time. So, imagine this and other bad habits involved many people to escape the same failure. At the same time, I started re-reading almost most the published books about the area to discover new facts and I pointed out what was wrong in series of articles and in a book. I poured my jam anger on the leadership in Ethiopia for beginning the invasion by attacking the airport. That has happened because I thought that the clashes of the borders will solve by more negotiations, but not by the air attack. That was the motive for my book by the title of “The Political Tragedy of the Horn of Africa”, which is the first book to publish in the area analyzing that event. 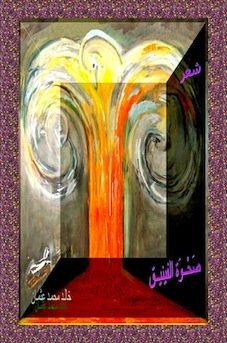 In addition, it follows the development and goes back to learn from the history to an era even no one had read about or understood correct, as there was no deep analysing in Arabic or in English. I heard this from many leaders; one of them is the Eritrean delegate at the UN. So, the events were not the purpose, but the analysis of the events. The cause was clear, but many people did not know whether there was enticing power behind the cause to mobilize it to damage our hopes or not, although the cause lies at a distance on the neighbourhood of the two countries. At that time and before the war, that dictatorial and terrorist regime in Khartoum was directly in the state of fed up of accusing Eritrea of disturbances and complained over it to the African Unity Organization before it became the African Union. The leader of the Sudan channel in the Eritrean ruling party picked me up from my office to another calm office the first time when the Sudanese regime submitted a complaint to the AU and I supposed to write the Eritrean plea. I made a strong copy of the Eritrean plea to use anytime the dictatorial regime submits another complaint. 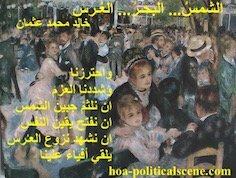 When the NIF regime with their leadership composed of the Muslims Brothers of Sudan fed up, the regime played the dirty role with the Ethiopian leadership using one of the Sudanese children's ways during any quarrel to entice each other. Any quarrel between two boys escalates when a third boy came in. 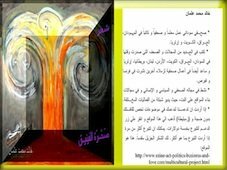 The third boy comes in between the two quarrelling boys with sands on his hand, stands between them and says “al madeeda haragatni” to encourage one of them to hit his hand to throw the sand on the face of the other and the real quarrel begins. This expression “al madeeda haragatni” is a local food, but take it as simply a hot mell soup. People in Sudan eat by hands and they eat very hot food, not cold food. That was exactly what the NIF regime in Sudan has done to entice the Ethiopian leaders to throw their fellow Eritrean comrades into the read sea and thus get Ethiopia isolated for later conspiracies against it. When Ethiopia is alone, the Sudanese dictatorial regime can do anything to destroy it, as it did in Somalia. This is a satanic conspiring regime Africa has never seen before. 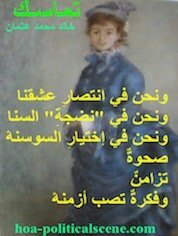 ** Read more in my book about “The Illusion and the Revolution - The Historical Backgrounds on the Ethio-Eritrean Wars”. 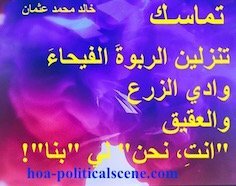 See "The Political Tragicomedy in the Horn of Africa". ** You are at Eritrean Hopes.